Chief Warrant Officer Two Cantrell was born in Dyersburg, Tennessee on 16 December 1975. He joined the U.S. Army on 21 July 1994 as a 95C, Military Policeman. He served in 2nd Infantry Division, Camp Howze, Korea, from 1994 to November 1995 before being assigned to Fort Bragg, North Carolina. He then served with 503rd Military Police (MP) Battalion, where he deployed in support of Operation JOINT ENDEAVOR to Bosnia-Herzegovina. He later served with the 13th MP Company, Southern European Task Force (Airborne) in Vicenza, Italy from October 1999 to October 2002. In February 2004, Cw2 Cantrell graduated from the Special Forces Qualification Course and was assigned to 3d Special Forces Group (Airborne), 3d Battalion, Operational Detachment (ODA) 381, serving as a Communications and Intelligence Sergeant on five combat deployments throughout Central Command, including Afghanistan and Iraq. 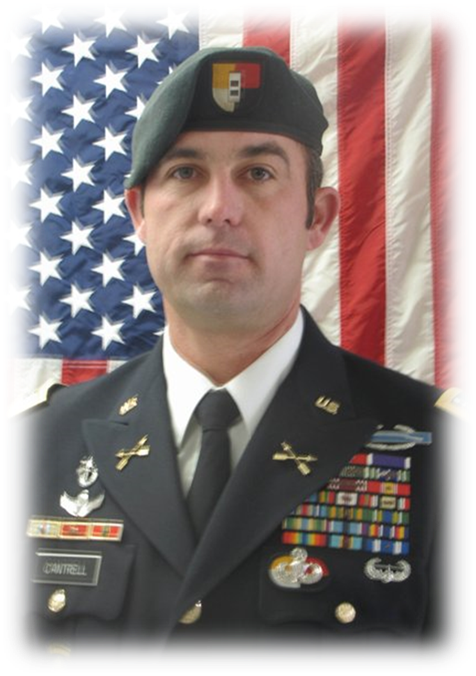 In January 2009, CW2 Cantrell attended the Warrant Officer Candidate Course, followed by the Special Forces Warrant Officer Basic Course, and was assigned as the Assistant Detachment Commander to ODA 3331. CW2 Cantrell completed six total combat deployments: one to Iraq and five to Afghanistan. He returned home from his most recent combat tour in support of Operation ENDURING FREEDOM in August 2011. CW2 Cantrell’s awards and decorations include the Soldier’s Medal. Legion of Merit, four Bronze Star Medals, two Purple Hearts, two Army Commendation Medals with Valor device, six Army Commendation Medals, eleven Army Achievement Medals, Army Good Conduct Medal, National Defense Service Medal with Bronze Service Star, two Armed Forces Expeditionary Medals, Kosovo Campaign Medal with Bronze Service Star, Afghanistan Campaign Medal with four Bronze Services Stars, Global War on Terrorism Expeditionary Medal, Global War on Terrorism Service Medal, Korean Defense Service Medal, Armed Forces Service Medal, Two Humanitarian Service Medals. Three NCO Professional Development Ribbons, Army Service Ribbon, six Overseas Service Ribbons, NATO Medal, Combat Infantryman Badge, Master Parachutist Badge, and the Air Assault Badge. He was also the recipient of the Bruce E. Price Leadership Award. Duane was the epitome of a Quite Professional. He was the most loving husband and devoted father. He loved to fish, but most of all spend time with his family. Duane and his wife Louise and their two daughters Isabella and Natalia lived in Hope Mills, NC. On March 6, 2012, they had a house fire. Duane and their daughters perished in the fire. Isabella was age 6 and Natalia was age 4. All three are laid to rest in Section 60 of Arlington National Cemetery. Since the tragedy, Louise created a non-profit to honor her family called Dancing Angels Foundation.